This sour, slightly bitter herb is used as an astringent, demulcent and diuretic and is valuable for treating conditions of the respiratory tract. Native to Europe, it has a long and traditional history of being used as a medicine dating back to Ancient Greek and Roman times. Internally it has been traditionally used internally in Bronchitis, Colds and Upper Respiratory Congestion. 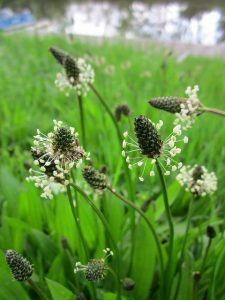 Within clinical practice, it has been found that Ribwort is as effective as Ma Huang (Ephedra sinica), primarily in hayfever. Phenolic acids (gallic, chlorogenic, cinnamic, caffeic acids), mucilage polysaccharides (mainly arabinose and galactose), iridoid glycosides (including aucubin and catalpol), tannins, silica, acteoside, aglycone aucubigein, five phentylethanoids, cistanosid, coumarins, saponins, flavonoids (apigenin and luteolin) and Minerals (zinc and potassium). Due to a lack of safety data for this plant is recommended to avoid during pregnancy.